The Amaranthine Flowers Prettiest In Pink Arrangement is a beautiful display of soft pastel colours, with pink asiatic lily that are long lasting and non fragrant, the romantic white lissianthus, pink carnations and bursting with lush mixed foliage. 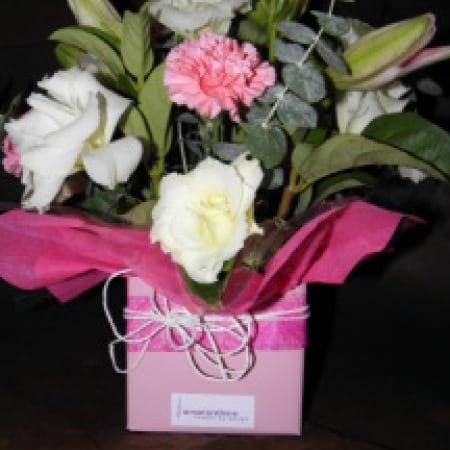 The perfect way to say, I love you, thinking of you, miss you, congratulations or our thoughts are with you, from Amaranthine Flowers By Design, New Lambton Newcastle. Same day delivery available, to all areas of Newcastle and Lake Macquarie, including John Hunter Hospital, Newcastle Private Hospital, Lake Macquarie Private Hospital, and Mater Hospital. Delivery available 6 days a week (Monday-Saturday) and Mother’s Day Sunday Delivery.